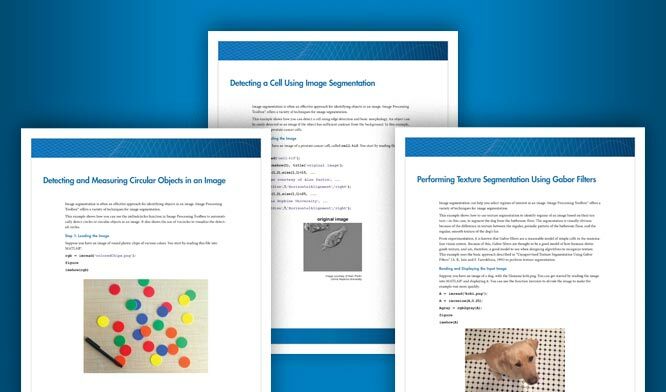 This example shows how to use control point mapping to perform image registration. Read the sample images and display them. In this example, the fixed image is westconcordorthophoto.png, the MassGIS georegistered orthophoto. It is a panchromatic (grayscale) image, supplied by the Massachusetts Geographic Information System (MassGIS). The image has been orthorectified to remove camera, perspective, and relief distortions via a specialized image transformation process. The image is also georegistered (and geocoded): the columns and rows of the digital orthophoto image are aligned to the axes of the Massachusetts State Plane coordinate system. Each pixel center corresponds to a definite geographic location, and every pixel is 1 meter square in map units. The moving image is westconcordaerial.png, a digital aerial photograph supplied by mPower3/Emerge. It is a visible-color RGB image. The image is geometrically uncorrected: it includes camera perspective, terrain and building relief, internal (lens) distortions, and it does not have any particular alignment with the earth. The example reads both images into the workspace. The cpselect function accepts images from the workspace or character vectors specifying the file path for the images. Select pairs of corresponding control points in both images, using the Control Point Selection tool. Control points are landmarks that you can find in both images, like a road intersection, or a natural feature. To start this tool, enter cpselect, specifying as arguments the moving and fixed images. Save the control point pairs to the workspace. In the Control Point Selection Tool, click the File menu and choose the Export Points to Workspace option. For example, the following set of control points in the moving image represent spatial coordinates. The left column lists x-coordinates and the right column lists y-coordinates. You can optionally fine-tune the control point pair placement using the cpcorr function. To use cross-correlation, the images must be in the workspace, and features in the two images must be at the same scale and have the same orientation. They cannot be rotated relative to each other. Because the Concord image is rotated in relation to the fixed image, cpcorr cannot tune the control points. Specify the type of transformation and infer its parameters, using fitgeotrans. fitgeotrans is a data-fitting function that determines the transformation that brings the image into alignment, based on the geometric relationship of the control points. fitgeotrans returns the parameters in a geometric transformation object. When you use fitgeotrans, you must specify the type of transformation you want to perform. The fitgeotrans function can infer the parameters for several types of transformations. Choose which transformation is suitable for the type of distortion present in the moving image. Images can contain more than one type of distortion. The predominant distortion in the aerial image of West Concord (the moving image) results from the camera perspective. Ignoring terrain relief, which is minor in this area, image registration can correct for camera perspective distortion by using a projective transformation. The projective transformation also rotates the image into alignment with the map coordinate system underlying the fixed digital orthophoto image. Transform the moving image (unregistered) to bring it into alignment with the fixed image. You use imwarp to perform the transformation, passing it the moving image and the geometric transformation object returned by fitgeotrans. imwarp returns the transformed image. The following figure shows the transformed image transparently overlaid on the fixed image to show the results of the registration.